Refresh your sense of Spring at the 2015 Epcot International Flower & Garden Festival—with fresh seasonal dishes, enchanting Disney character topiaries, complimentary presentations and more! Epcot’s famous International Flower & Garden Festival will be back in town from March 4 – May 17 this year, and you can discover dazzling gardens, delicious seasonal cooking and high-energy entertainment at one of central Florida’s most popular springtime events. You’ll be able stroll your way through stunning series of topiary displays and gardens showcasing designs or trimmed to look like your favorite Disney characters and then savor the taste of spring as you enjoy a variety of seasonal dishes and beverages. After you’ve had your fill of food and flowers, you can stop by for the festival’s Fun Fresh Weekends, which will feature classic acts like The Village People, STARSHIP and more. Epcot’s International Flower & Garden Festival will also host a variety of special events and demonstrations where you can learn more about horticulture and Florida agriculture, as well holiday events like the St. Patrick’s Day Celebration at the American Adventure. For more information on the 2015 Epcot International Flower & Garden Festival including concert and entertainment line-ups, visit the event’s Disney home page. 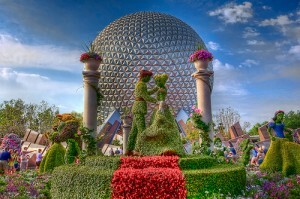 Are you planning on going to the Epcot International Flower & Garden Festival this year? Have you been before, and did you enjoy it? Let us know in the comments below!